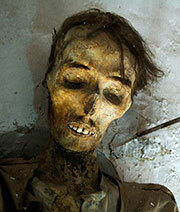 This morning old Tano Bongiorno spent an hour reminiscing about my childhood visit to the Capuchin Catacombs. I understand the remains of some of my ancestors are down there. So then I thought I should tell you about this monastery, which has one of the world’s most famous underground cemeteries right here in Palermo Sicily. I hope I don’t make you shiver (and I’m not talking about the Mafia! 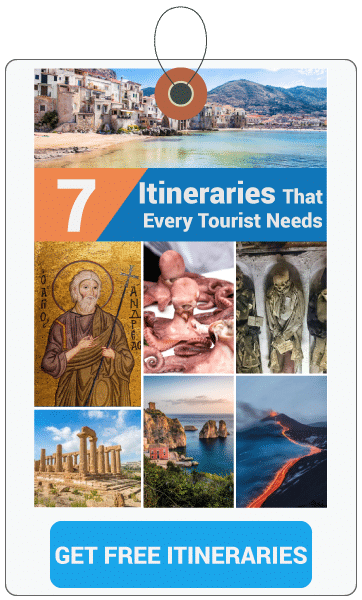 )But when you read the sordid details of this amazing locale, the Capuchin Catacombs, you’ll not only shiver but sit back in wonder at some of the amazing, often almost unbelievable events that have taken place over the many years right here in Palermo. But I have to warn you, if you want to visit this underground cemetery, you have to be one tough cookie and you’d better have a strong stomach as well. But if you do decide you want refreshment, you’d better bring along some sandwiches and drinks. It doesn’t seem quite rational, but we mere humans appear to have an irresistible urge to be terrified. We simply love it. Look at the constant supply of horror movies and television shows that roll off the Hollywood assembly lines. If there was not such a thriving market, Hollywood would go to something else. 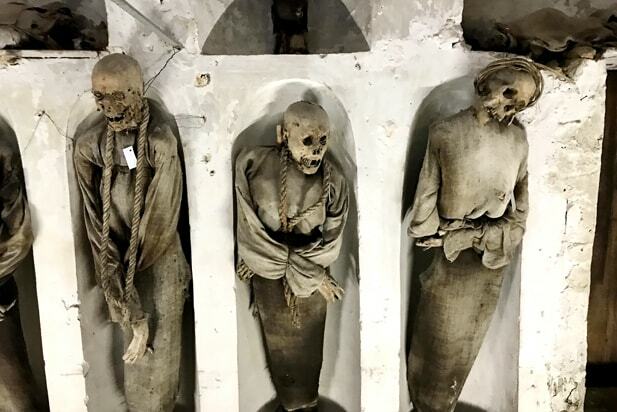 Well, down in the Capuchin catacombs old Don Tano promises that you’re gonna experience some long-lasting feelings of dread, dread that gets more gripping with each step forward. 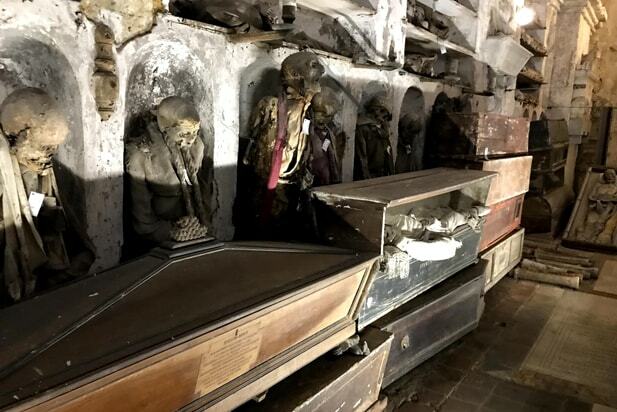 The underground cemetery of the Capuchin Monastery, somehow wrongly known as Catacombe di Palermo (The Catacombs of Palermo), is the resting place (?) of the mortal remains of not only monks but famous, wealthy and even some ordinary people. These tunnels were built by the friars and preserved by them. The tunnels not only lie beneath the monastery but beneath the adjacent church as well. This church has been dedicated to the Lady of Peace. 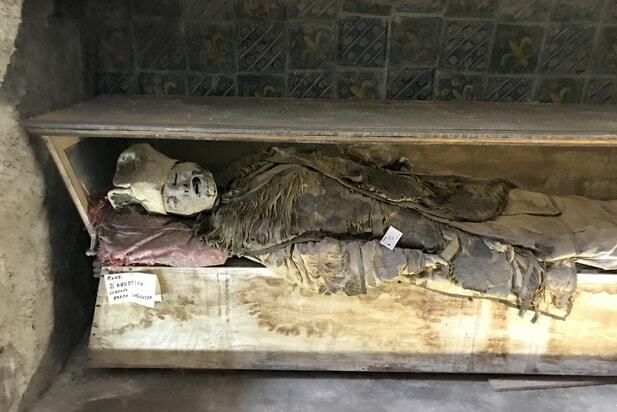 Today about eight thousand mummified bodies repose there, some dating back to the seventeenth century and continuing until the end of the nineteenth century. The moderate climate conditions of this burial site and the methods used by the friars to embalm the corpses allow the bodies to be well-preserved. They lie almost intact and recognizable. A very weird scene, I must tell you. 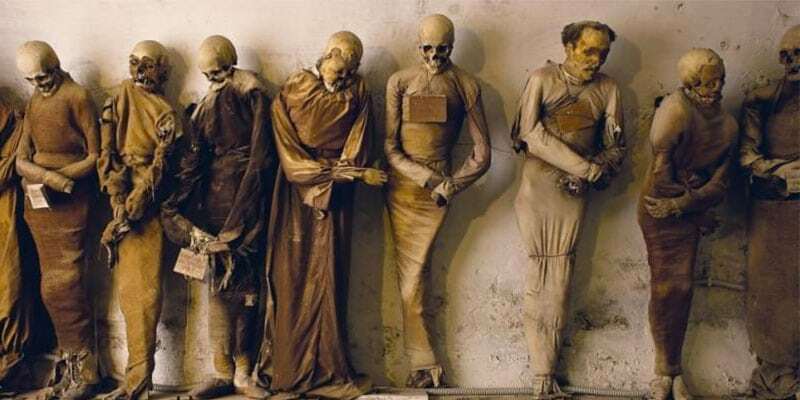 Some of these mummies could almost be alive, but immobile. One of the most famous corpses preserved in the Capuchin Catacombs is that of little Rosalia Lombardo, resting in the Chapel of Santa Rosalia. This beauty is famous mostly because looking at her, you almost believe she could be alive. For this reason, she has been dubbed The Sleeping Beauty. Rosalia Lombardo was born right here in Palermo in 1918. She died of pneumonia on the sixth of December in 1920. She was one of the very last persons to be eligible for burial in the crypt beneath the monastery. Her heartbroken father supervised and supported the embalming process performed by Professor Alfredo Salafia, who also embalmed Francesco Crispi. Although the Catacombs might really shock you, it’s still a sight you should see. There’s nothing quite like it elsewhere. I was taken to the Catacombs once when I was very young because I was told some of my ancestors rested beneath the church, but that one visit took my appetite to visit underground cemeteries and I’ve never been back. Tickets cost 3€ and visiting hours are from 9 to 1 and then open again in the afternoon from 3 to 6 p.m. I try never to steer you wrong so when I tell you that you should shell out another 3€ for a guided tour lasting about 45 minutes. I can’t say that’s gonna make you more cheerful, but it will be a lot more informative than just wandering about all alone among so many mummified corpses. But one word of warning: Because of the delicacy of conditions below the ground, it is forbidden to take photos. You are requested not to use your cell phone during your visit. For more information, visit Palermocatacombs.com and you’ll see something of what I’ve been talking about. And if you have any scary questions or doubts, don’t hesitate to drop a comment here and I’m gonna get right back to you as soon as I can.